MET: while volunteering with the Peace Corps. WHY DID BETH & JOHN WANT COACHING? I work with lots of clients brand-new to non-monogamy who want to hear examples of couples who make it work. It is not uncommon at all for healthy poly folks to experience unintentional shame from the helping professionals they try to hire. Even healthy couples need a communication tune-up every once in a while. Read more about Beth & John's story (and those of three other successful open relationships) here. WHY DID JENNIFER & BRIAN WANT COACHING? Jennifer: "We're both most worried about what this could do to our kids, or their friends at school if anyone finds out. I mean, it's a pretty liberal school as far as gay people go, but this is something else." Brian: "That is the biggest concern for sure. They're pretty young now, but soon they'll be asking questions. I don't know what we'd tell them or the other parents at soccer for example." Download their full case study to learn where Jennifer & Brian's non-monogamy path took them. WHY DID AMY & MARK WANT COACHING? Download their story and read three other examples of healthy non-monogamy right here. WHY DID CHEYENNE & CLAY WANT COACHING? Download their full case study to learn more about how I worked with Cheyenne and Clay, and where their non-monogamy path took them. When I started out serving folks in non-monogamous relationships many years ago there were VERY few resources and tools available that specifically focused on open relationships and polyamory. So I spent years borrowing tools form other areas of psychology and tailoring them to meet the needs of our community. Enter "bookending," a concept from addiction recovery communities designed to help folks in recovery create intentional structures when they knew potentially triggering events were coming near. For example, someone in recovery for alcohol use might set up bookend structures like a call to a sponsor before and after they attend a wedding where a lot of drinking could occur. By creating a purposeful strategy they're setting a mindset for more positive interactions. And by reaching out to someone who cares they're combatting the shame often debilitates people in recovery processes. Shame prefers isolation and secrecy. Some people opt for more introverted bookend supports. They might outline a self-care plan for before and after an event, they might text a friend or review their personal accountability agreements before and after to honor their growth and continued progress. So what does this have to do with open relationships? Non-monogamy is not the same as addiction. But the experience of triggering and overwhelming emotion couples with high-reactivity that comes up in many people can lead to a similar shame spiral felt by those in recovery. And it can feel like reactions are out of control in a very similar way. Plus, these reaction/shame spirals can damage relationships in similar ways to the outcomes in addition relapse. Not the same, but similar. So I ask my couples to anticipate potentially triggering events on their path to non-monogamy and create individual and relationship/couples bookends around them. Individual Bookends = self-care plans to support your integrity and health and manage reactivity that could arise. Relationship/Couples Bookends = practices of rituals that nourish your connection before and after the event. Kelly and Thomas have decided to open their relationship after six years of monogamy and want to start by meeting people on OkCupid. They anticipate having threesomes and dating separately in the coming weeks and months. Each of these triggering events carries different meaning and different potential emotional triggers for the two of them so I'm not going to go into all three (Kelly, Thomas, and their couple) bookends for each here. But I will outline them for the first example (online profiles going live) below. "I plan to take a run the day our profiles go live to help me get rid of excess anxiety. I also want to talk to my individual therapist beforehand and then I have a girlfriend who knows what's going on I plan to call if something intense comes up." "I already made an appointment with a new therapist for the day we picked to go live. I think it will help me to use the Self-Control app to block the website once we make it live so I don't check the app all night. I told my good friend at work what's going on and we're getting breakfast the next morning I I need to debrief (if not we'll just have a good hang out)." Kelly, "I'm going to feel better about this if we have time to cuddle before we publish our profiles." Thomas, "Yeah, that'd be sweet. We should make dinner and just chill a bit before we do it." Thomas, "We can just take the dog for a long walk together. I like our walks." Kelly, "Great. And I will make sure I turn the app off that night so I don't get distracted from our connected night either." If you want help creating these kind of bookend practices to support your relationship's health as you start opening things up I'm happy to talk with you. Set up a free consult, I have room right now. Just a quick SUPER EXCITING announcement (and an explanation on why I haven't been blogging as much) for you. Not only did I become a parent very suddenly and unexpectedly this year, but I have been working really hard to meet a publishing deadline for my book: Negotiating Successful Agreements in Open Relationships. Every time I meet with a new client it becomes more clear just how needed this resource is in the world so I've been working my tail off this summer to bring it forth. It'll be out in a couple months. In the meantime, I wanted to share the purpose behind this work for those of you who are interested. 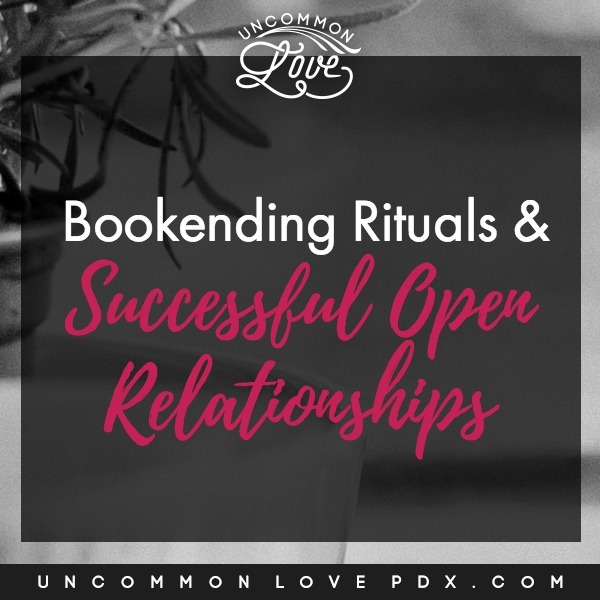 Here's the deal: there are a FEW great books sharing basic vocabulary and compelling stories of folks living non-monogamous lifestyles... but there are NONE that really outlining the nuts-and-bolts HOW to manage the day-to-day in an open relationship. If you're like most my clients you've read tons of blogs and the three big books on polyamory or non-monogamy and they may have been triggering and affirming in many different ways. But after talking through the decision-making and negotiation process with thousands of couples it's clear- the books and blogs are great- but they just don't help you with the HOW part when emotions run hot. AND while some of those books and blogs are written by great people who've been practicing nonmonogamy for a while- many of them have no expertise or training in relationships. So that's where this book comes in. I'm bringing ten years professional experience and research on successful open relationships to the table as well as my training in couples counseling to help readers access proven tools for navigating open relationships- and staying together. Keys to successful agreements: well-researched formulas for staying together with partners as you open your relationship. Tools to make solid agreements and change them as you grow together over time. The most important considerations for maintaining respect, desire, and care when beginning your open relationship. The skills you need to manage jealousy and insecurity in healthy ways. Awareness of the most common pitfalls when beginning an open relationship. A process for conflict resolution and care that’s neither codependent nor callous. A solid baseline for balancing healthy boundaries and connectedness. Tools to stay connected to your original partner while developing new relationships. Skills to communicate in meaningful positive ways through potentially rocky times. Enter your information below to be notified when the pre-order begins. I'd love to have you. There are many aspects of being in a non-monogamous, poly, or open relationship that are similar to those of a monogamous relationship. There are also some notable differences. I’m going to cover a couple of the unique challenges to give an example of how some relationships cope. When your relationships fall outside of the mainstream vision of what they can look like it is important to think carefully about the words you use for yourself and others when you talk about your relationships. This means being able to name and describe your relationships. You can use the terms that are in general circulation or make up your own! Arrive at an agreement with your partners that works for everyone. It doesn’t need to be permanent or perfect, just take the time to learn the way to talk about your relationships that feels meaningful and congruent.